We returned from vacation just in time to enjoy the spring religious holiday celebrations. With my interfaith household, there is a little bit of everything. It is a delicious time of year. 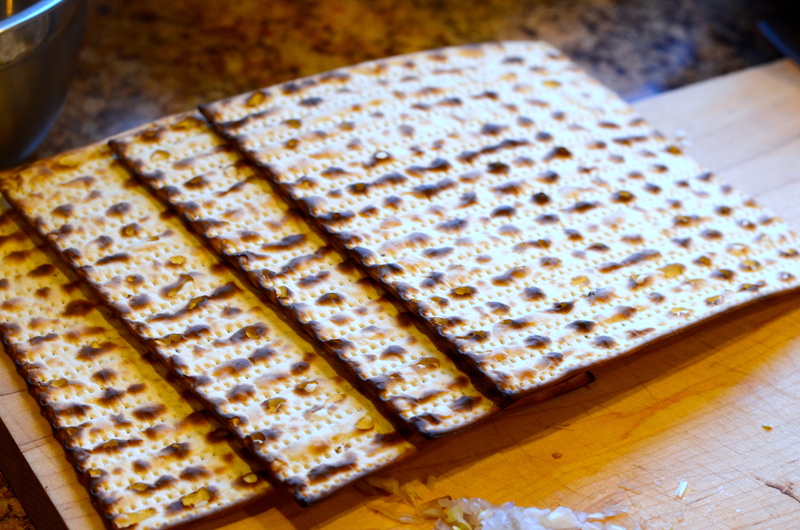 In spite of the absence of leavened bread, the Passover Seder meal is one of the most highly anticipated meals of the year in my husband’s family. Much of it centers around the famous beef brisket, which is paired with the hottest horseradish they can track down. If you’re curious, this year’s verdict was that Holy Schmitt’s had the best heat and flavor combination, and the Atomic blew everyone away, but wasn’t so flavorful otherwise. 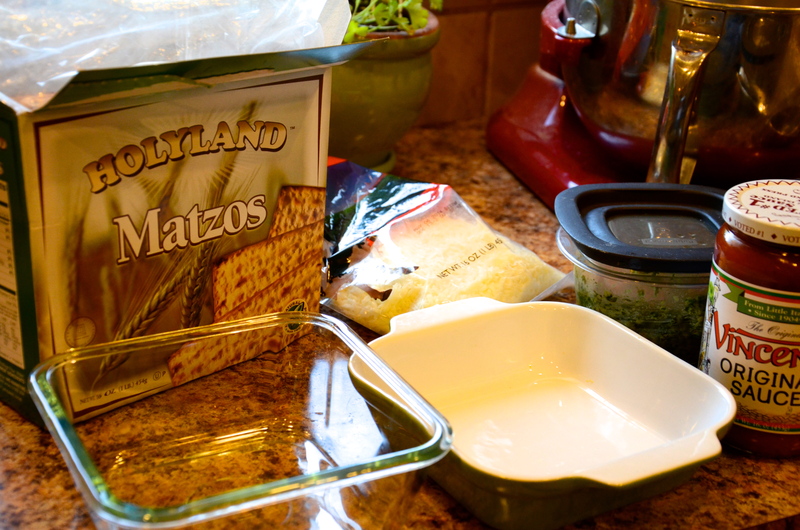 It is no secret that one can create highly adequate substitutions for traditional dishes using matzo or matzo meal. (Egg, of course, produces magical effects even without yeast.) When my husband was young, he would come home from school almost every day during Passover and make matzo pizza. Story has it he was so proud of himself for this “invention.” God knows he can’t handle going more than a few days without his beloved pizza. 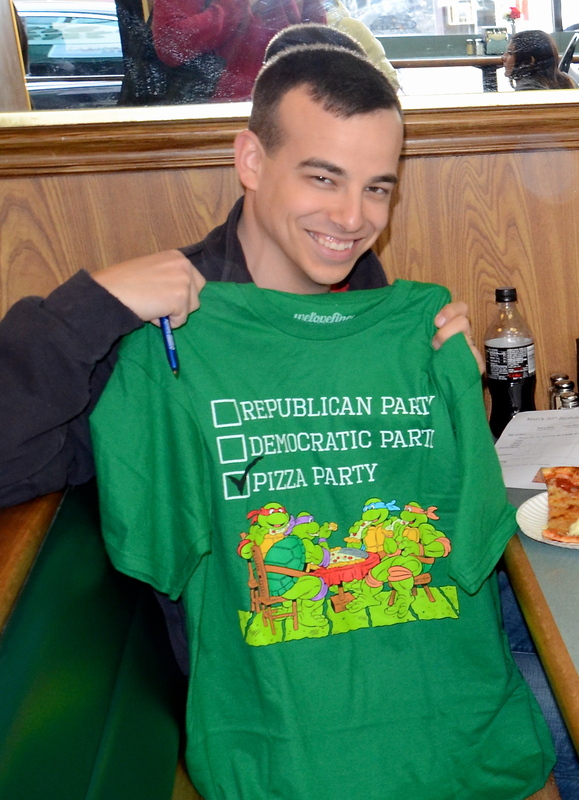 I even got him this T-shirt for his birthday last year. 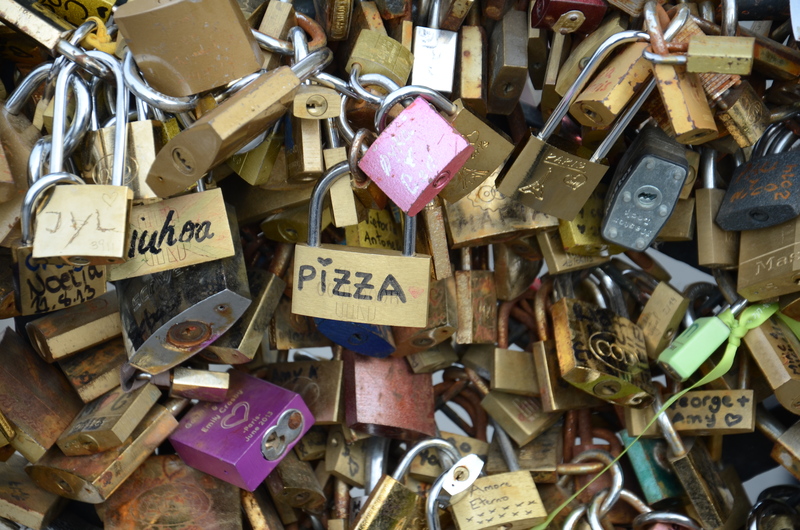 When we were in Paris, we passed over the bridge filled with “love locks“, and while we did not add our own, I thought this one at center might as well have been left by Matt. When I was making matzo crunch/chocolate caramel matzo brittle for the Seder the other day, and some pieces were accidentally overlapping, Matt had the bright idea of matzo lasagna. A couple of days later, we decided to extend our vacation bonding time and cooked together with leftover matzo. 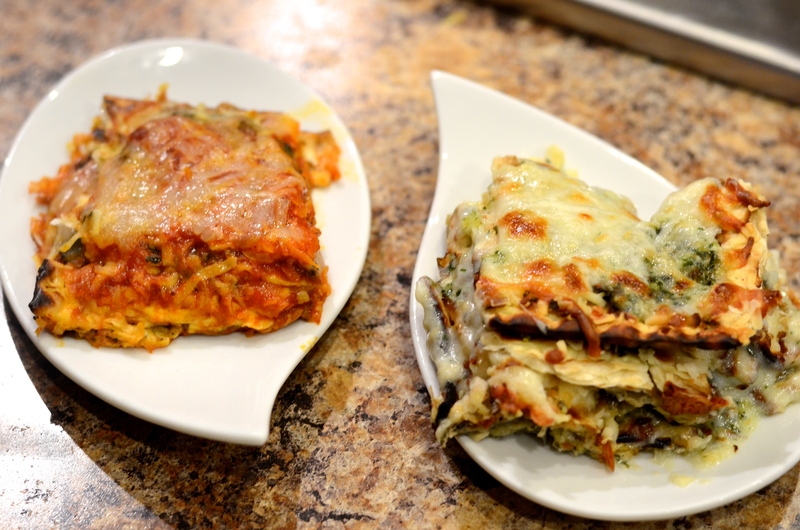 We created two savory matzo lasagnas that incorporated cheeses and the remains of two different kind of pestos from the freezer. This hardly deserves a written recipe, because you could throw whatever you want and whatever you have in the layers. Various sauces, vegetables, meat…even leftover brisket! Lasagna normally has a ricotta and egg mixture, but we didn’t have ricotta so we left that out. 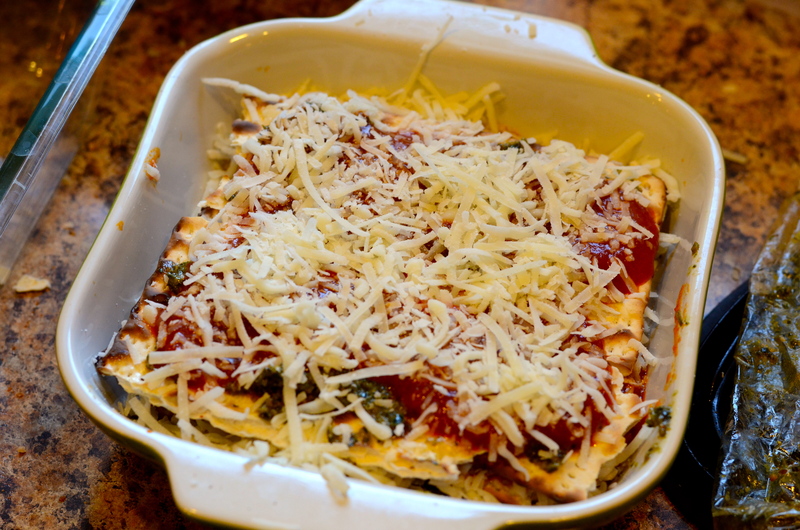 I found when searching Google for “matzo lasagna” that the top recipes use cottage cheese–didn’t have that either. I made one combined bowl of shredded mixed cheeses and split it between the two lasagnas. There are classier recipes out there. Needless to say, it’s hard to go wrong with melted cheese, sauce, and a carbohydrate vehicle. Start with a quick spritz of cooking spray at the bottom of your pan. Add a little tomato sauce. 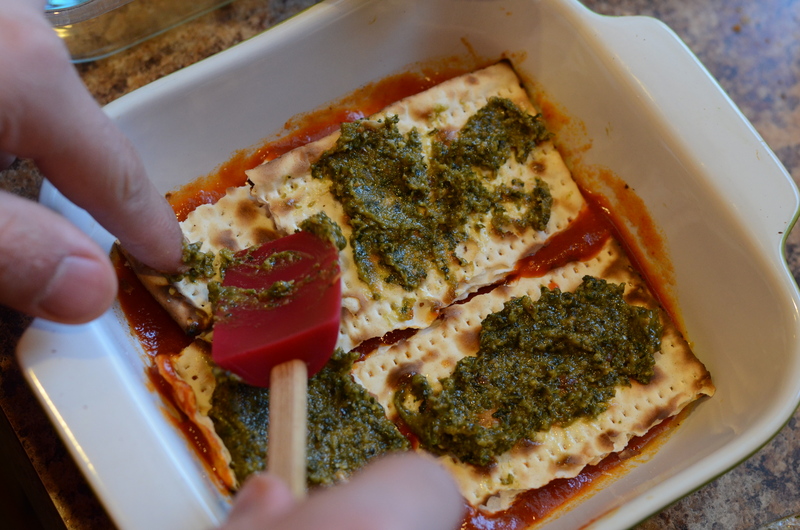 Then spread some basil pesto on the pieces of matzo going on your first layer. 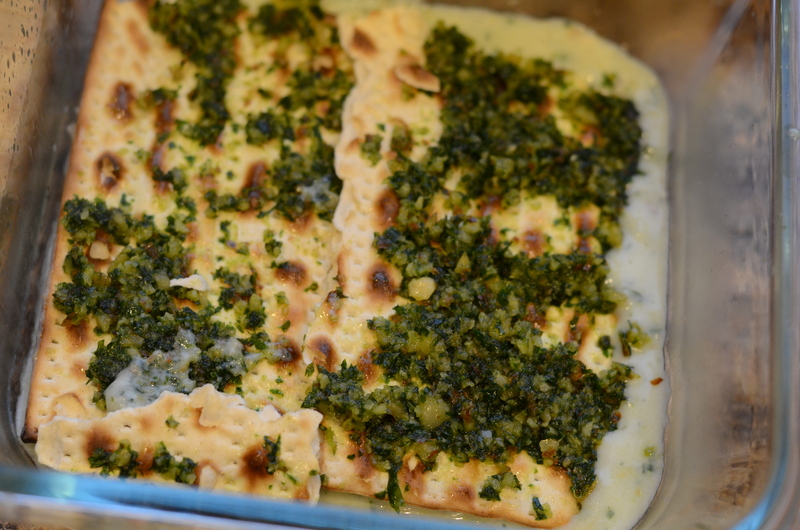 It is easier if you spread the pesto on the matzo before setting it in the pan, but this works too. Sprinkle about 1/3 of your cheese mixture atop the pesto, and then pour a little tomato sauce on top of that. Repeat with at least two more layers, reserving cheese for the top layer. Cover with aluminum foil and bake for at least 10 minute to bring up to temperature. Remove the foil layer and bake for about 5 minutes more. If you wish, turn the oven to broil for a quick two minutes to brown the cheese. This is what it looks like WITHOUT extra baking/broiling time, which I recommend. 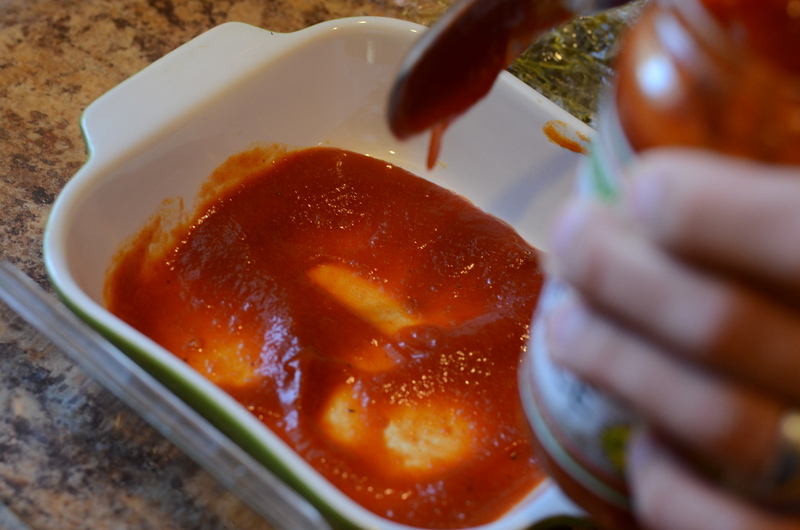 Prepare the sauce: heat a saucepan on medium-high and add the butter to melt. 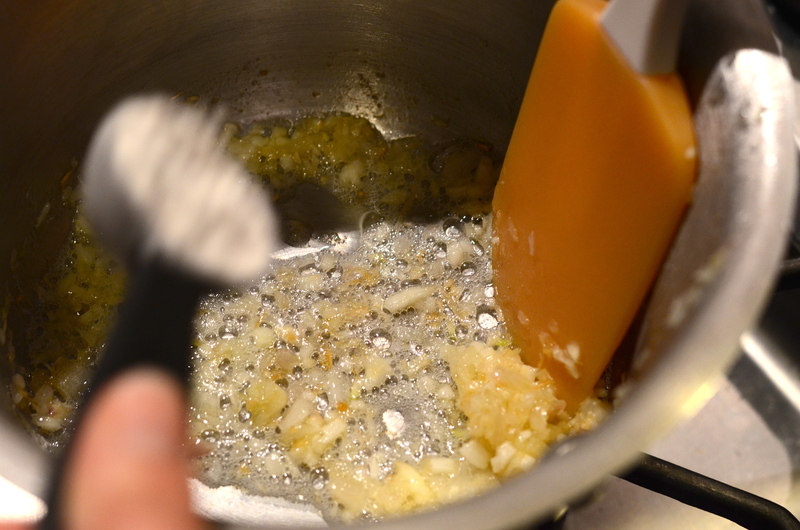 Cook shallots, stirring frequently, until translucent, about 3 minutes. Add garlic and cook for another minute. Stir in the flour and cook, stirring frequently and controlling the heat to prevent browning, about 1 minute. Slowly whisk in the milk and chicken broth. 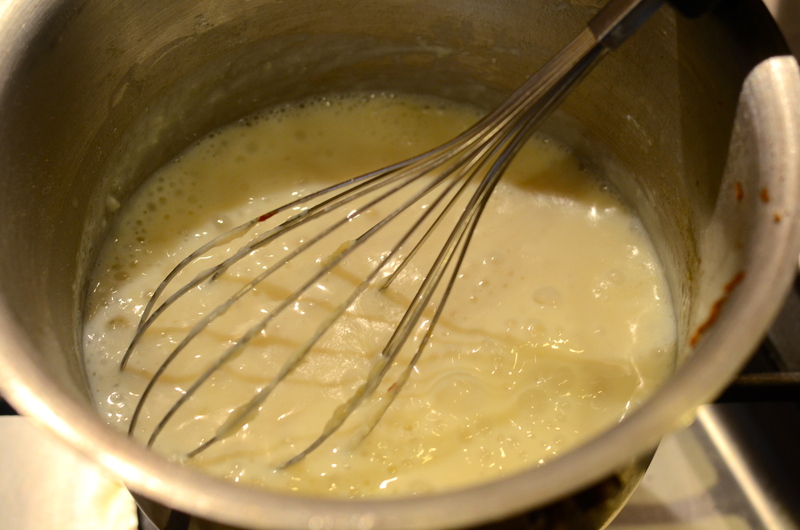 Bring the mixture to a boil and continue whisking until the sauce has thickened and coats the back of a spoon, 10-20 minutes, depending on the type of milk you are using (add a little more flour if it isn’t thickening after 10 minutes). Remove the saucepan from the heat and stir in a Tablespoon or two of the prepared pesto. Taste for seasoning and add salt and pepper as needed. Spray the bottom of the pan with cooking spray. Spread a layer of pesto cream sauce. Start your layering with some pesto-covered matzo. Layer on the mixed shredded cheeses and more pesto cream sauce. 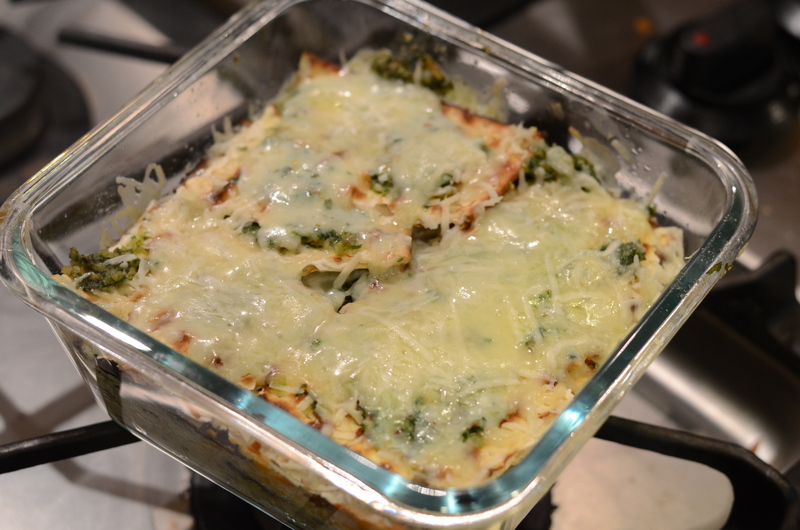 Continue with these layers, finishing with shredded cheese on top. Cover with aluminum foil and bake for about 20 minutes to heat through. Remove the foil layer and turn the oven on broil. 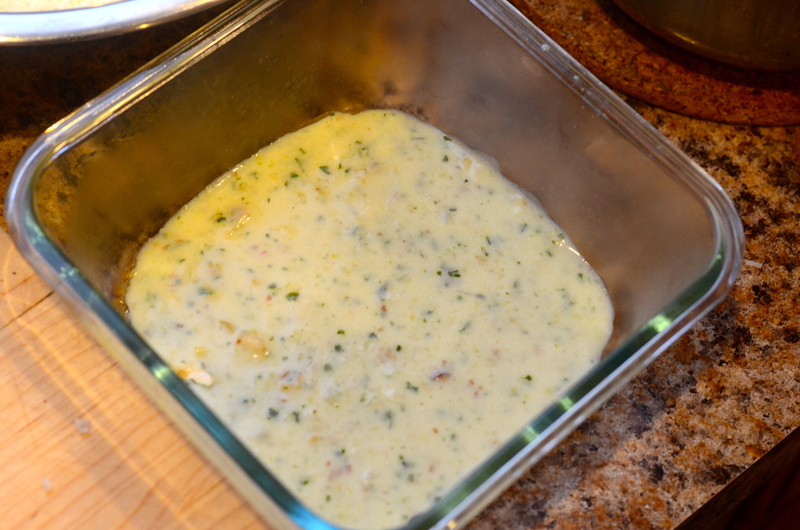 Add pan back to oven to broil the cheese for 2-3 minutes. 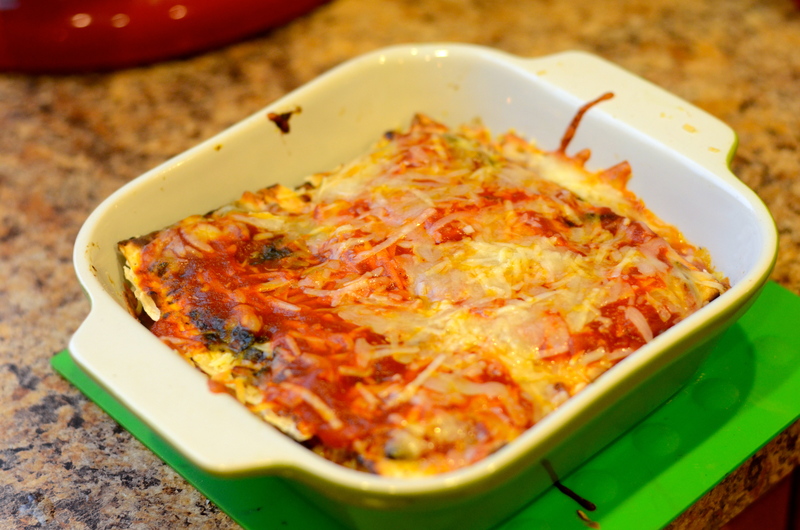 This entry was posted in Fast and easy, Recipes and tagged bechamel, cheese, lasagna, marinara sauce, matzo, mozzarella, parmesan, passover, pesto. Bookmark the permalink.